The Passion of Woo & Isolde, by Jennifer Tseng, winner of the 11th annual Rose Metal Press Short Short Chapbook Contest, is tiny fiction at its best, a shining example of the powerful punch short fiction can deliver. Divided into three parts, there are 24 short fictions, and each one can be read in a couple of minutes or less, but you’ll want to stay with them longer. You’ll want to breathe in the beautiful prose, soak in the rich language, and linger with the quirky characters. The book is small, much like the mouse in one of its stories, but don’t be deceived—the tales that wait between the two-color letterpress covers of this limited edition chapbook are as huge as the lion in that same story, and as remarkable as a covenant between a lion and a mouse. Writers, take note: if you want to know how to write powerful short fiction, this is how it’s done. 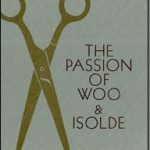 The Passion of Woo & Isolde will be available from Rose Metal Press in August 2017. You can read an excerpt from the book, and check out the book trailer, over at Rose Metal Press. You can find more about the author on her website. Many thanks to the publisher for the opportunity to read and review this gorgeous chapbook.